This euphorbia is usually considered half-perennial, half-shrub. The flower colour is a rich deep orange with red, and the flowers appear in summer. 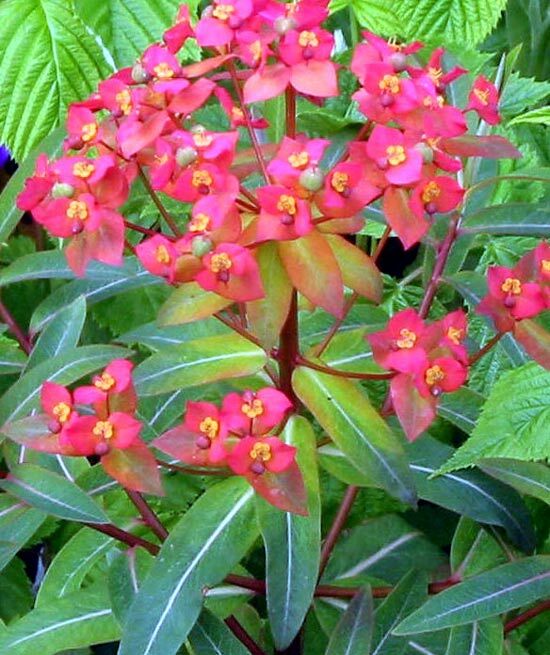 Apparently it is a Himalayan species, properly named Euphorbia Griffithii, and the cultivar found in most gardens is aptly called 'Fireglow". This is a most beautiful perennial / shrub, though I am still waiting for mine to bulk out a bit. The garden where it is planed has some rogue raspberry canes which I'm trying to get rid of - they tend to take over in late spring. This is a great pity, as it's easy to miss the subtle beauty of this shrub's flowers.